After the previous days failed attempts at getting to Brisbane we finally boarded the 2.30pm Byron to Brisbane service. 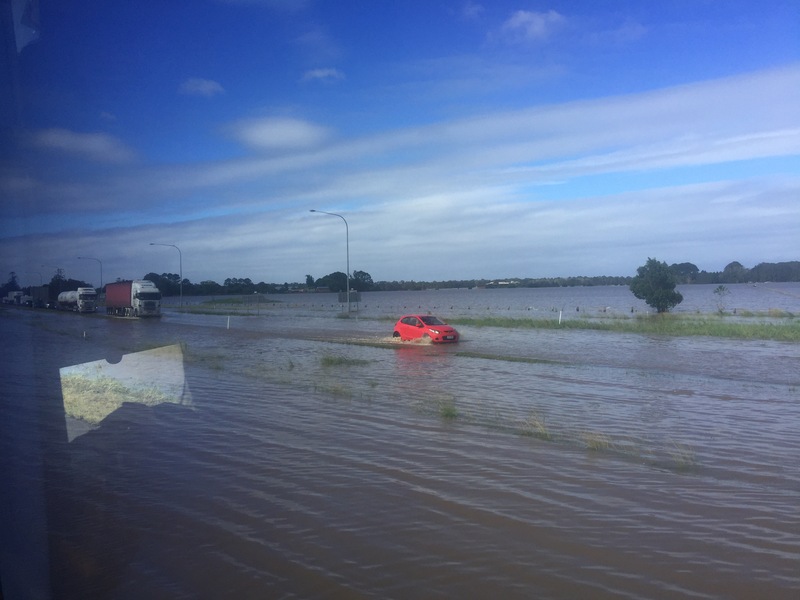 Having navigated flooded fields and queues of car slowly crossing flooded sections of roads the Greyhound coach arrived into Brisbane only slightly late (plus we gained an hour for a change in time from NSW to Queensland) and our luggage was thankfully dry and not covered in flood water. A quick Uber later and we arrived at our AirB&B that our friends Tom and Neal had organised. 24 hours late they greeted us with sparkling wine and snacks. The AirB&B was beautiful: excellent layout, stylish rooms and stunning kitchen and bathrooms. Plus luxury hot showers a comfortable king size beds. We caught up on the terrace over a glass of champagne or three and made plans for the evening. Mike and Neal went and got some more wine and Mike came back excited by the view of the city he had just seen. 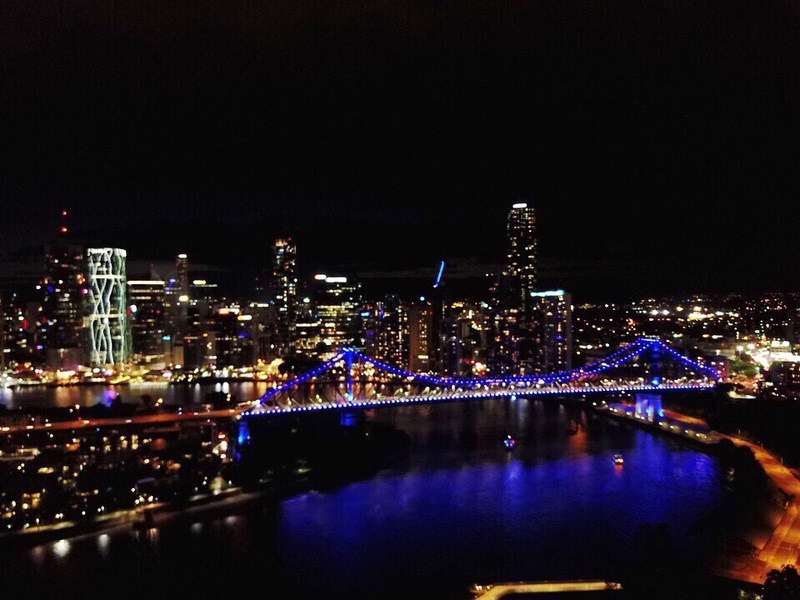 As it was now pitch black out, he launched the drone from the back garden and soon a beautiful bridge with Brisbane in the background came into view on his 6inch iPhone screen. Once he had got the photos he wanted we got ready for an evening out. We walked into Brisbane via the bridge and more photos and found a place for dinner. A slightly rough biker bar but the food was tasty nonetheless- Mike and Sam couldn’t even finish their food! A first! After eating we walked a fair way to a recommended bar. Not really sure why it was recommended we had a few there and left to another. This one was much more our style and taste. After a few drinks out front, we discovered the garden was a dance club and we spent too much money buying shots and getting too drunk. A good time was spent with our friends Tom and Neal and all too quickly the night was over. After a good nights sleep it was time to once again pack and head for the airport. Our flight was scheduled and Prosopine airport (Whitsundays) had reopened following the cyclone. We would be one of the first flights headed into the area since the Debbie had swept through. We called our hotel ahead: one to check they were open and find out any information about what was open. Our boat around the Whitsundays had already been confirmed in an earlier phone call so we were all set to leave. At the airport we stocked up with water and food as we had be advised it was in short supply at Airlie Beach our destination. 12 litres of water, crisps, cereal bars and sweets later we were stocked up and ready for what awaited. 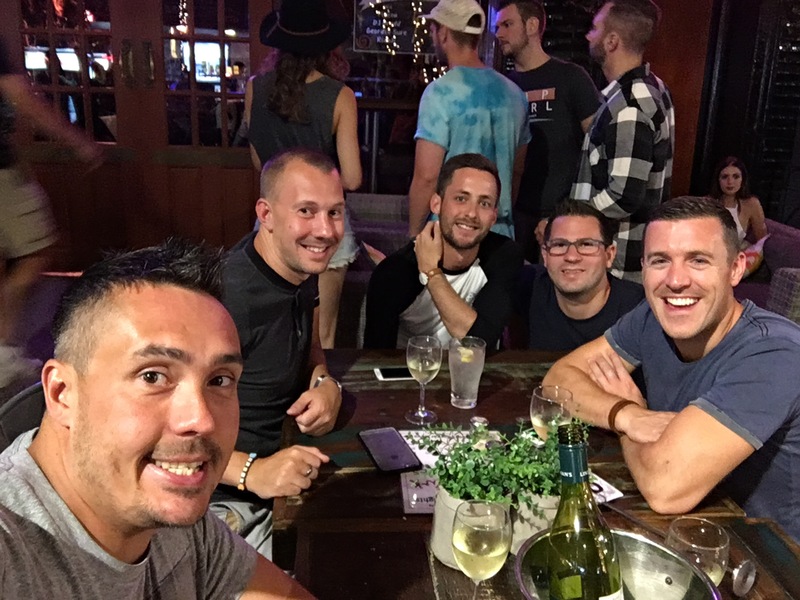 Brisbane had been brief and cut short by the cyclone but we had enjoyed a good night out. A shame we didn’t get to see the city by day or catch up with our friends but fun nonetheless.